This is a translation of Wagner's poem into modern English prose. It is not a poetic translation (on the subject of which, see below), nor is it intended for singing. Wagner's stage directions are given complete and literally. I have provided a commentary to help the reader form his or her own interpretation of the text: these notes draw attention to symbolism drawn upon by Wagner from religion and mythology, in both the western and eastern traditions; and it indicates some of the allusions made in the text to literature, spirituality and philosophy. Wagner made many small changes to the text while he was composing the music; I have shown in context the differences between his original poem, as it appears in Gesammelte Schriften und Dichtungen, and the words that appear in the score. Act 1 - A forest, shadowy and impressive but not gloomy. Rocks on the ground. A clearing in the middle. The background slopes steeply down in the centre to a lake in the forest. Day is breaking. Act 2 - Klingsor's magic castle - on the southern slope of the same mountains, facing Moorish Spain. In the inner courtyard of a roofless tower. Act 3 - In the domain of the Grail. Open, pleasant area on a spring day. Towards the background gently rises a flowery meadow. The foreground includes the edge of a wood, a spring and a hermit's hut. Very early morning. To produce a singable translation of any of Wagner's operas is a very difficult task. It is easy to criticise the results that any translator has achieved but one should first consider the challenges. The easiest stage of translating any libretto is that of literal translation: rendering, as closely as possible, the meaning of the original text into the target language. This task grows more difficult as one progresses through the Wagner canon in chronological order, not least because Wagner's texts became increasingly ambiguous. 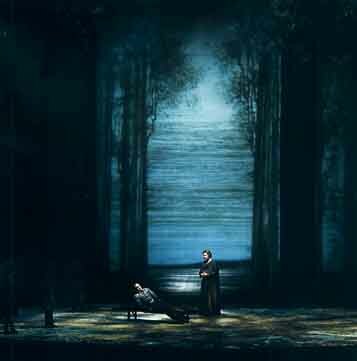 On reaching the metaphysical language of Tristan and the religious language of Parsifal and in view of the frequently obscure (to the unenlightened reader) texts of these operas, the translator has little chance of an exact translation, even into prose. To achieve accuracy, much study is required to achieve the necessary understanding of the work. Unfortunately few if any of the available English translations of these operas show sufficient understanding on the part of the translator. Next in order of importance to accuracy is consistency. There are obvious, frequently-occurring key words in Tristan such as Sehnen, Sehnsucht, Ehre, Wonne, Lust, Sühne. The translator should try to translate these words consistently. An important pair of words in Tristan is bewusst (conscious) and unbewusst (unconscious); these words occur at a few significant points in the work. All key words need to be translated with great care to avoid losing meaning where it is important. The second stage in the production of a singable translation is to fit the words to Wagner's music. In Wagner's scores, words and music work together to convey meaning that words or music alone could not. The translator must find suitable words to achieve the right number of syllables in each line and keep, as far as possible, the metre (stress pattern) of the original poetry. It is difficult, if not impossible, to achieve this without sacrificing accuracy. For example, consider the closing lines of Tristan: Unbewusst — höchste Lust! . Mapping unbewusst to its exact translation does not fit the stress pattern needed here. Alternative words are sought in vain: Lionel Salter finds nothing better than the exact translation "conscious"; Andrew Porter chooses "unaware", which does not convey the meaning of the German in the context. Incidentally, Porter's translation of Lust as "love" here is simply wrong; Lionel Salter scores higher with "bliss"; another good choice would be "joy". Similar considerations apply in the case of Parsifal. The third and final stage is to match, where possible, the rhyme scheme of the original and, since Wagner liked to alliterate (sometimes inadvisedly), to match the alliteration of the German text where it occurs. Within the constraints of accurately conveying the meaning of the original and fitting the words to the music, the translator often has little room to manouevre with rhymes and alliterations. The most successful translator of the Ring, in my opinion, in terms of all of the objectives and constraints stated above, was Rudolph Sabor. His books on the Ring (Phaidon Press) include his excellent poetic translations and, in the first volume, a long discussion of the task of translating Wagner's poetry and its challenges. Sabor disdains the solution of changing the order of lines, which Porter sometimes chooses to employ, except to avoid the error of following the word order of German grammar rather than that of the target language. In the process, both Sabor and Porter sometimes make the Ring libretto clearer in English than it is in the original language! With the libretto attached here, I have only completed the first, literal stage of translation. Copyright notice: Except for copying to disk for archival purposes, and for normal fair use exceptions relating to the quoting of short passages for purposes of commentary and the like, no part of the writing or the non-public domain graphics either herein or in the local links hereto may be reproduced, stored in a retrieval system, transmitted or retransmitted in any form by any means without the express prior written consent of Derrick Everett. Rights in remote links are as established by their respective owners.